Here are the results, in a graph, showing which budget categories, responders have the biggest problems reducing. A few days after posting the survey, I realized that the question was a bit ambiguously phrased. For example, housing costs may be hard to reduce further because they have already been significantly reduced (why athletes will lose any fitness contest based on relative weight loss) or they may be hard to reduce because of some inherent quality, e.g. the unavailability of inexpensive housing. The results are given below. I was not surprised that housing cost came in as #1. In the past, especially in the past decade, housing has been promoted as a sure-fire speculation. Real estate prices never go down. Buy as much house as you can afford. Over the past 4 decades, housing sizes have gone up radically. It is not surprising that people then a) find themselves with too much space and b) unable to find smaller places. It is not impossible though as this exercise shows. I urge you to go through it even if you have no intention of moving; just to prove a point. One thing that did surprise me is that people have their stuff under control. We have no conspicuous consumption of gadgets and consumer junk. Does that mean that people are not living in large spaces because they need space to store everything? I used to think this was a primary problem: “I can’t move into something smaller, because my footprint is too large” or “I need to move into something bigger, because I’m running out of space”. The biggest surprise to me was the eating out category. Wow! This is a bigger problem than car payments and health insurance which I had guessed would be on third and second respectively. I hate eating out, so I have no problem controlling it. It is interesting how eating out generally means eating less healthy (a cheap way of making things taste good is loading them up with salt and fat/oil) which in turn drives up health insurance costs in the long run. It is interesting to note that some of the biggest companies in the US are drug companies and junk food companies. It is a good investment strategy: making people sick and then alleviating their symptoms. But please try not to be a victim of it. Then, of course, there is the social aspect of eating out. This is a cultural phenomena. I should probably reserve a blog post for alternatives to eating when hanging out with other people. The biggest surprise was transportation coming in at #4. Either everybody walks and rides a bike or the expensive car, accounting for around 20% of the average budget or $1,000,000 extra in retirement for someone who works their entire life, is considered nonnegotiable. Or you all drive 15+ year old cars. 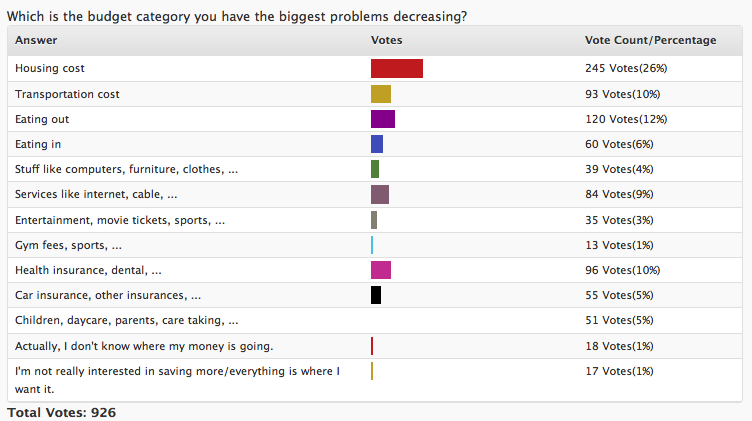 30 users responded in " Budget reduction survey results "
*17 year old car, but drive it 3-4 times a month (90-120 miles). Trains and bicycles at all other times. Eating out could be seen as a bigger “problem” than car payments and health insurance because it’s not necessary. That doesn’t mean that people spend more on eating out than health care. Hmm – interesting break down indeed. For me, housing can be brought down, but I wonder what other costs might go up. I really enjoy having a pool right there (as you’ll see sunday Jacob), and my apt has a washer/dryer inside, saving in time and money (to a certain extent) of going to a laundromat. Car – I drive a company car…with company gas. SO drives a 15+ (I think) y/o car, and it gets close to 30 mpg. Health Insurance – I actually *make* money on this because my company pays $750 towards an HSA and my annual cost is $500 for health insurance (roughly). Eating out – my downfall, but working on it. Lunch @ work is what hurts – since my job takes me to different sites daily. Just need to get back to brown-bagging it. Other – My bar is probably my other largest expense besides recon missions (vacations) around the planet. I voted for eating out. It’s a time factor. Too many of my resources are spent going to and from work as well as being at work. When I get home, I don’t want to think about what to make for dinner. I actually really like to cook and when I’m off for an extended period of time, I tend to get into a habit where I spend an hour or two a day preparing meals for us. To answer the stuff question: We have a small house that I bought before I met the husband. Most of the crap in the house is mine as he moved in with the contents of a Toyta Tercel. The house is under 1000 sq ft, and even if we did have kids, I can’t see us getting something bigger. As for our car? Well, again, something I bought long before I met hubs, and I intend to drive it into the ground. It’s ten years old, and I’m hoping to get another five years out of it. (Our model tends to crap out at 200 000kM.) We use on weekends. I bus to work, and hubs has a company vehicle. Eating out: it’s the next biggest expense I need to address. 15 year old Honda civic, 245,000 miles, paint is faded, but runs like a champ, only replaced the muffler and radiator as they were both rusted out.–dang Illinois rain/salt on roads. For me, housing costs … tied myself into a year long rental contract, after choosing a place based on emotional attachment. Still love the place, but love the 50% of my income rent payment much less. Will definitely fix this as soon as the year is up. Eating out was fixed by learning to let go of the idea that ‘cooking’ meant fixing up a good meal from scratch. Now, I know I don’t have time to cook a big meal, so I’ll do pasta and tinned tomatoes, or a quick stir-fry. Not the worlds most exotic and tasty cuisine, but it beats out a take-away from the chinese in price. And if I can retire early, I’ll have plenty of time to cook beef wellington or whatever! My health insurance has risen more quickly than any other and is now my #1 expense. As for housing, the expense the HI replaced as #1, my co-op board (I am not on it) has done well to keep maintenance increases to a minimum (zero for 2010, in fact). They have been implementing one of my ideas to keep the maintenance increases low. That’s 62% of my early retirement budget. The rest of it stays pretty much the same, increases a little, or even decreases a little. @Suzie – I’m trying to keep a little bit from every large, easily reheatable meal to freeze. This way I can build of a stock of things to eat when I’m feeling really lazy and don’t want to cook. I wish I could just make up some pasta and tomatoes, but the husband won’t eat that! Stir-fries are on the lists of dishes I need to learn how to assemble. For most of my life I have driven 10-15+ year old cars. When there was the cash for clunkers thing, I cashed in an old clunker and bought a new car at the price of a used one. I plan to drive it for a very very long time. Eating out is hard to kick. I really really enjoy expertly made food. Perhaps where you ate out it was just salt loaded food, but where I live there is a huge variety of very tasty restaurants. I think it’s more a reflection that we have the gadgets & stuff that we’re comfortable with and aren’t desiring more. What we have trouble with is swallowing the costs associated with housing those possessions. Housing… the 1 acre is nonnegotiable (organic gardening lifestyle) and the workshop is nonnegotiable (dry space in the temperate rain forest is of premium importance). Home size is somewhat negotiable as long as the workshop is large enough. Overall, though, the home is 1/3 of monthly expenses until it is paid for. That’s 4-5 years from now unless I unexpectedly lose my job… we do have contingency plans if that happens and can choose whether to hold out for 2.5+ years or pull up stakes for different life. We have a 2-yr old car and it’s paid for. It is the tool that gets me to/from the job that pays for the home and is necessary for transporting elderly mother to doctor appts. Represents 10% of monthly expenses which is reasonable… 5% operating expenses and 5% parking. Health insurance won’t be an issue until the early retirement is ready and it’s not in the category of something that will prevent me from exiting. If 2) is large enough, then 3) might not be an issue. @et, according to a Bureau of Labor Statistics survey, for households earning more than $70k pre-tax, on average, more money is spent on food away from home than healthcare. For those who’ve never looked at what “we” in the US spend our money on, the BLS expenditure survey is very revealing. On average we spend far more on transportation than health care. We, as a populace, own 2 of the big 3 American car companies, both of which are/were bankrupt, and we offer tax incentives to get people to spend more money on cars. Yet health care, not consumerism, is viewed as the mother of all financial parasites. Your Day 1 post on lowering housing costs is good, but it’s not comprehensive. Try to find a $200-$350/mo place near downtown New York or San Francisco or even Boston. Finding a place where you can share a bathroom/kitchen/etc with 18 people is close to impossible; I’ve been watching Craigslist RSS feeds for two months now, and I don’t think it exists in my city. I’d love to hear more about where you found it, and other ways that a single person can spend under $400/mo on housing in an expensive city. @akratic – See the last paragraph of that post. I was living in a dorm in Basel, Switzerland at the time. It was somewhat unusual for a grad student to do that, the other grads either had their own apartment or they shared it. Vehicles are prone to elements of the weather such as hot sun, high heat in parked vehicles, and bad roads, ice and snow and mud. Any vehicle, new or used falls into this problem. You may have the latest 2010 model or a 1990 model, the element factor takes it’s toll equally. You could buy a new vehicle and take very special care of it, proper services, replacing all the wear items, copious detailing when you wash it, and garage it, and with good care you could expect 10 years, 250,000 miles. You can do the same with a used one, and this is the best cost factor since the “big hit” has been taken before you buy it. There is really no need to drive a junker, as you can do many good things at home with parts and waxes and good care. It just all depends on how you take care of it, or anything else you have. Even a marriage can last 50+ years if you take care of it. I am coming up on my 46th anniversary this month. And, no, it’s not easy, it takes doing and effort. There are 2 kinds of eating out. The first which is have no problem reducing to near 0 is the “I’m too lazy/busy to cook so I’ll eat out” kind of eating out. This often falls into the cheap fast-food kind of eating and usually is indeed loaded with salt/fat/oil. The second however I’m not a fan of reducing at all. It’s going out to a not very expensive but good bring-your-own-wine restaurant with friends and having a nice evening. I reduce this sometimes by hosting at my place and cooking but it’s nice to spend an evening at a restaurant with good company and a few bottles of wine. I don’t mind spending money on eating out when it’s spent on making me, my girlfriend and my friends happy. I do however pack a lunch for work every day rather than eat out. Given that, it’s very hard for me to reduce my spending here given that I’ve already reduced it as much as I want to and that if I reduced it more I think my ROH (return-on-happiness) would go down. I think housing costs is one of the toughest (mentally), but not so tough (economically) to decide upon. Most of us want a “nice” and “safe” place (myself included). Then we add amenities such as washer/dryer, pools, etc (using myself). But, there are alternatives such as Jacob’s RV. Given the cost of housing is relatively high, if not the highest in the nation, here in the bay, Jacob still doesn’t pay all that much. Anyways – around the corner from my apt complex is a Mobile Home park (one of the largest in the bay) and space rent there is $800 a month, on average, and could be more or less depending on house size. My co-worker pays a mortgage on the pre-fab house he has there too. If you outright bought one, it might cost 100k or so, and then you only pay the space rent ($800 or $400 per person). 100k could theoretically take 5 years easy on the average salary here, so I imagine scaling downwards the further to the middle of the country you go. 600 USD is the cheapest house you can find in the northern part of Belgium. You could move to the south, but then you’d have to speak French all the time. Moving to another country is something I’m looking at, but that’s easier said than done and I’d have to leave my friends and family behind. It’s a big step to take. So yes, housing is the most expensive thing and it’s therefore the main thing on my list to find a solution for… but it’s not that easy. @Andy: if you’re single, think shared housing. @Andy: where exactly do you live? I’m in Gent. I’ve also been thinking of moving abroad. It’s a sense of adventure that’s driving me. I don’t know your motives, but if it’s financials alone, it’s likely not worth being away from friends and family. Not all readers live in the US. In order to save on housing costs, I built my own home. We built in a rural area, so land was cheap (<$1000/ac) and I was able to save enough from a well paying IT job, and made enough on selling our house in Toronto that we were able to build the house cash. By doing most of the work myself I estimate that we saved close to $100,000. My biggest expense right now is transportation, but I keep that to a minimum by driving a 14 year old Corolla that gets around 40mpg, but my commute is still about 35km. I hope to solve that by starting a business where I can work from home. I recommend that once having a job is no longer a consideration, meaning you have achieved FI, then relocating outside of any large metro area, and high cost area, would be wise. The Midsouth and Midwest are recommended. You can live very well in these areas, and I think having land to grow something to eat is wise. Get out of traffic, people, crime, stress, and high cost areas. entertainment, transportation, housing these are the main expenditures in my life that are hard to reduce. Especially as i grow my career i find myself being able to go out and enjoy nice dinners and looking for a bigger/nicer place to live. Is it me or is the price of food slowly creeping up? I was a also pretty amazed to see what a large percentage food expenses are. Eating out is definitely something I try to avoid—but I do have some local favorites (Thai and India restaurants that are hard for me to replicate at home). But lately I have been working on my skills at the grocery store to eat cheap. That’s a pretty good post idea. I’ll do a search because you’ve probably got this covered. I find that in order to have more time, having a vehicle is a necessity (A second one for our family in this case). I save 1 hour of time that I can used better than transit. Family life is quite busy with kids and homework. Time appears to be a luxury. @Concojones: Shared housing never even crossed my mind, because it’ll probably cause frustration at one point or another. Even if it’s with a good friend, there is still a lack of privacy that is harder to live with in the long run. But it could be a viable option though. I’m from the province of Antwerp. Moving abroad crossed my mind, but not especially for the finances alone though. That would indeed not be worth it. But even if it’s for the sense of adventure, you’ll still be away from friends and family. That would remain an obstacle to overcome. For me it was housing costs, because I’ve already reduced them as far as I’m comfortable doing. Maybe I answered the quiz wrong. Perhaps reducing housing costs is not hard for me: it’s so easy, I already did it! My wife and I joke about having to pay the “Ivy League Meal Tax” every so often when certain of our friends go out to eat (we went to such schools and have noticed that it’s more prevalent with that set of friends). I’ve started to avoid those meals, or suggest alternative spots. I enjoy the hanging out, but have started to get annoyed at the associated price tag.